We are not an MOT testing station, although some of the team here are ex-inspectors (passenger and LGV) so we know exactly what to look for. The knowledge and experience our team have in MOT testing enable us to offer excellent pre MOT test inspections to our customers. Your American RV motorhome has the same MOT test as your family car does (class 4), this is because it does not carry a load, or its type approved, which means it cannot be tested as an LGV. An American RV motorhome does carry passengers but not enough to qualify as a bus, so a PSV test cannot be done either, leaving a car test (class 4) the only option. Problems with this occur when you own a pusher (engine at the rear) with air brake. Most testers have never seen under a vehicle of that size, let alone understand how air brakes, air suspension or s-cam brakes work, therefore leaving the American RV motorhome vulnerable to many safety issues. This is why our technicians inspect your vehicle before it is presented for an MOT test. 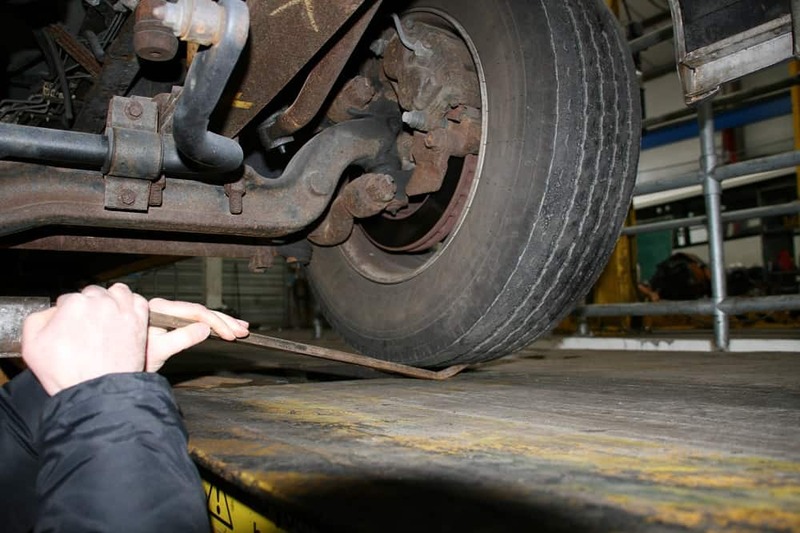 It includes inspecting all of the class 4 requirements as well as many extra items not applicable to the MOT test, although very important to safety. Many American RV’s are built on Workhorse/Chevrolet chassis and are equipped to carry up to 18,000 lbs in weight. Some of the steering joints can constitute a failure to some MOT testers, in particular, the left-hand boomerang steering joint. A ball joint is pressed into the boomerang and even from new has a built-in amount of lift, which often attracts a fail. 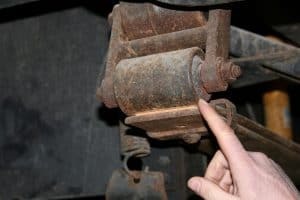 The bottom ball joints need to be tested in a particular way with the jack being placed under the bottom wishbone; this allows the ball joints to be tested correctly with a tolerance of 3/32”lift acceptable. If the lift is greater than this extreme outer edge tyre wear is noticed at first, then the ball joint may come away from the socket causing the front wheel and stub axle to come off. We consider that we are the experts, not the testers, and we will make the final decision, not the tester, as to replacing parts if they are needed, or leaving them if they are not. Our technicians will make sure your American RV motorhome has been inspected thoroughly and correctly prior to its MOT test. For more information on MOT’s call us now on 01604 861999.